Stephen Colbert is starting the Greatest American bracket off real strong. 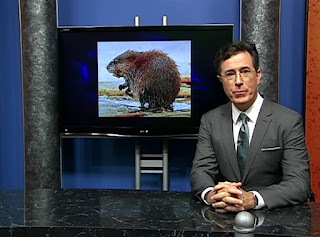 As part of some unexpected viral marketing for his hosting job on The Late Show, Stephen Colbert has traveled to Monroe, Michigan and hosted their public access show. In the 45 minute long bit, Stephen meets with local Monroans, reads some Yelp reviews and even has a conversation with a special guest which is crazy. Watch the whole segment here, if you have all the time in the world. If you have only a fraction of that, skip ahead to the 22 minute mark for the interview that everyone is sure to be talking about. Also remember to vote here on the Greatest American bracket, in which Stephen is currently competing.